Updated design for 2017, all the same great features, plus a more comfortable, easy grip handle! 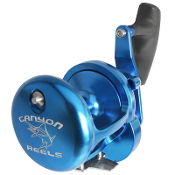 Canyon Reels' HS-18 High Speed Jigging Reel is unmatched in power! Incredible power and super smooth performance make the HS-18 the perfect choice for jigging, bottom fishing, drifting and just about any use that you can think of! A large, deep spool with the capacity to hold 600 yd. of 60# braided line and the extreme free spool performance make the HS-18 a great choice for surf casters. The HS-18 is the finishing touch for many specialty rods and custom rods available today. Weighing only 28 oz., the HS-18 is a powerhouse that outperforms reels that are more than twice its size and weight! Backed up with a 2 year warranty that is twice as long as our competition, the HS-18 is built to last. Every reel is loaded with Cal's Drag Grease to provide the fisherman with one of the smoothest operating drags on the market! Gear Ratio: 6:1.1 ratio is designed for high speed jigging!